Like many Eastern European cities, Prague’s celebration of Christmas makes it a popular destination for tourists in December. Fortunately, although the Prague weather in December is cold, the rainy season is over, so you won't get soaked partaking in the city's outdoor Christmas festivities. 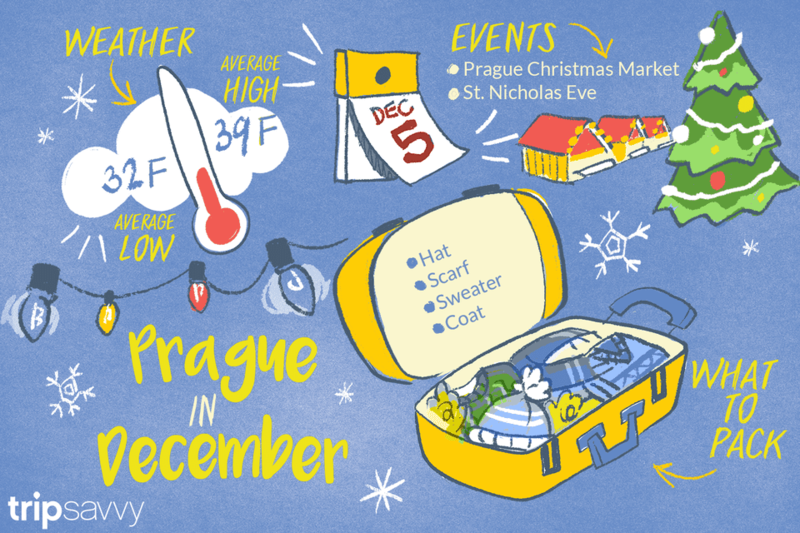 With an average daily temperature of 35.5 degrees Fahrenheit—and not much of a range between the high and low averages—December marks the start of the cold season for the capital city of the Czech Republic. However, the average precipitation (rain or light snow) this month is less than one inch over an average of five days, so you won't have to worry too much about staying dry on your trip. The days in December are short and usually overcast, meaning you'll only experience a few hours of sunlight per day before the sun sets around 4:30 p.m. Additionally, temperatures drop about 10 degrees Fahrenheit overnight, and as a result, if you're planning on checking out some of the festive lights decorating village squares around the city, you'll need to bundle up even more. The key to staying comfortable in Prague this time of year is to pack plenty of layers; sweaters, long-sleeved shirts, pants, insulated leggings, and thermal undergarments are all recommended—especially if you plan to stay out from day to night. Although you can comfortably leave your raincoat and waterproof shoes at home, you may still want to bring an umbrella and insulated, comfortable footwear since rain or a light snowfall may occur and you'll likely be walking a lot during your visit. One of the biggest draws to the city this time of year is the outdoor Christmas markets; Old Town Square's outdoor marketplace, in particular, is a popular attraction in December because its historic architecture is lit up for Christmas. Additionally, holiday activities and events last all of December in Prague; in addition to the Prague Christmas Market, an annual Christmas exhibition at Bethlehem Chapel showcases crafts and decorations created around a holiday theme. However, if you're looking for something unrelated to Christmas or the holiday season while visiting Prague in December, the only real option aside from temporary exhibits and theater performances is to attend the Bohuslav Martinu Music Festival concerts. St. Nicholas Eve (Mikulas): An annual event that takes place on December 5 in which the Czech Saint Nicholas rewards good children with treats in Old Town Square and elsewhere around the city, often accompanied by mischievous angel and devil guides, as is the tradition in Czech folklore. St. Mikulas dresses like a bishop in white clothing, rather than the red outfit Santa Claus wears. Christmas Eve: The Czech Republic celebrates this day with a feast featuring a main dish of carp. In addition, the Christmas tree is decorated with apples, sweets, and traditional ornaments, and baby Jesus (Jezisek) is the star of the show who brings presents instead of Santa Claus. New Year's Eve: On the last day of the year, Prague celebrates around the city with fireworks lighting up the sky as well as festive street parties and private events at bars and clubs in Old Town and beyond. Bohuslav Martinu Music Festival: Named after the famous 20th-century Czech composer, this festival features music performances in concert halls across Prague. If you’re visiting the city specifically to attend the Christmas market, it makes sense to book a room near Old Town Square, which will make getting to the market easy. Rates for Prague hotel rooms in December will be on the moderate-to-high side and will sell out, so book as far in advance as possible. If you travel to the city during the first half of the month, you'll likely find significantly cheaper prices on airfare and accommodations than if you travel closer to Christmas Eve and the end of the year. Czech folklore says that baby Jesus lives up in the mountains, in the town of Bozi Dar, where a post office accepts and stamps letters addressed to him; you can make a day trip to this small city if you want, but you'll find plenty of celebrations around Jesus on Christmas Eve in Prague, too.